Charles Chu's Drefong cleared the entire 12-horse group of sophomores at the start of the G1 King's Bishop, then found a soft opening quarter to his liking as he was able to power away down the stretch to an easy 3 1/4-length victory under veteran Mike Smith. The son of Gio Ponti galloped home in a final time of 1:21.25 for trainer Bob Baffert, recording his first graded stakes win in his fifth career start. Drefong was extremely sharp out of the starting gates in his first east coast start, easily clearing the field from his outer-most post position in the first several jumps. Mohaymen, the post-time favorite, was quick off the blocks as well, but was not as sharply into stride as the rest of the field and would up in the center of the field early on. With a one-length lead, Drefong led Noholdingbackbear and Summer Revolution through a first quarter in a pedestrian :23.11, with Economic Model, Fish Trappe Road and Mind Your Biscuits not far behind. Mohaymen had a bit of traffic behind those, six lengths off the lead. Approaching the first turn, Drefong had picked up the pace to cover the half-mile in :45.85, but Canadian shipper Noholdingbackbear was still tracking strongly just in behind him. Drefong allowed that rival to cut into his lead for the briefest of moments at the top of the lane, then changed leads smoothly for Smith and powered away with no issues to win by 3 1/4 lengths at the wire. Economic Model moved up the middle of the track to finish well in second, just defeating the game Noholdingbackbear by a half-length. Summer Revolution held on to be fourth. Bred in Kentucky by Frederick M. Allor, Michael T. Barnett, and Anthony M. Warrender, Drefong was a $450,000 Keeneland September Yearling sale purchase by the Tanma Corporation. Having recorded three straight wins in allowance company on the west coast, Baffert stepped him up to graded company successfully this Saturday. Overall, Drefong boasts a record of four wins in five starts with earnings of $375,000. 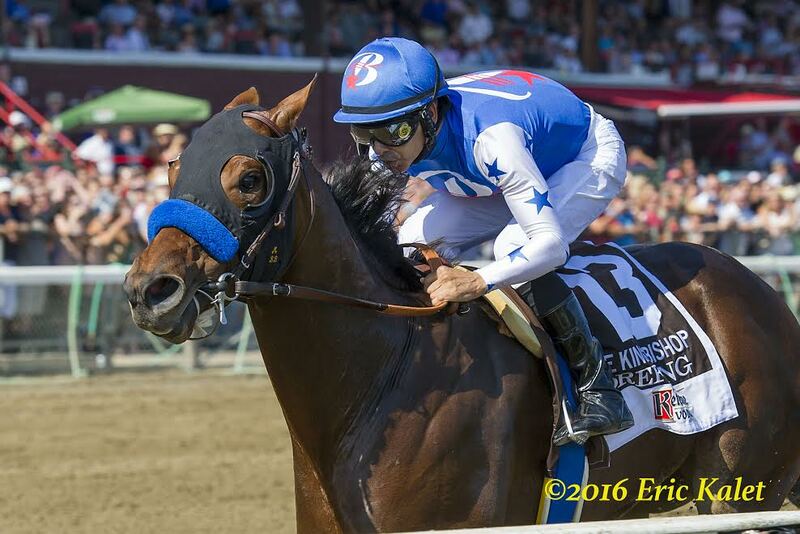 This entry was posted in Racing, Videos and tagged Bob Baffert, drefong, economic model, fish trappe road, gio ponti, King's Bishop Stakes, mike smith, mohaymen, saratoga, tom's ready by Paulick Report Staff. Bookmark the permalink.